← Does Image2PDF have some special features? How to convert mhtml to jpg? Someone wants to convert mhtml to jpg file format.Because jpg format is one of the most popular image file format nowadays and you can design,edit or view jpg file format by many kinds of software such as a very famous one,Photoshop.But how to convert mhtml to jpg and what kind of software should you use? Don’t worry,HTML Converter Command Line can do you a great favor.It can convert web pages to PDF, PS (postscript), WMF, EMF vector formats.HTML Converter Command Line also can create previews or thumbnails of web pages in a number of different formats, such as TIF, TIFF, JPG, JPEG, GIF, PNG, BMP, PCX, TGA, JP2 (JPEG2000), PNM, etc. You will find the command line is very convenient and fast because you should only input some dos commands in the dialog box then click “Enter” button on your keyboard.What you have to do next is just waiting for a few seconds. This article will tell you how to finish the conversion of mhtml to jpg by HTML Converter Command Line.You can follow the steps below. 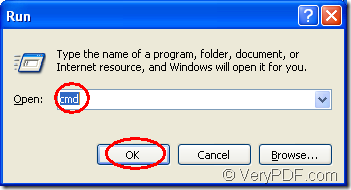 There are two methods to run cmd.exe. 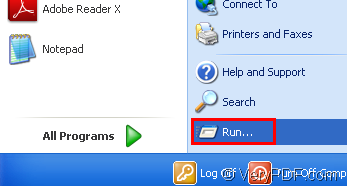 Method1.Click “start” – “run” and input “cmd” in “open” edit box.Then click “OK” button.Please see Figure1 and Figure2. 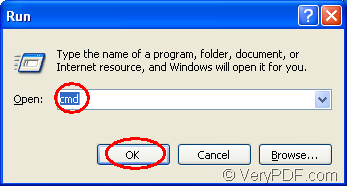 Method2.You can use the hot key “Windows” + “R” and input “cmd” in the popup dialog box like Figure2 directly. You should input commands in cmd.exe dialog box to convert mhtml to jpg file format.The commands should contain called program,source file and target file.Please see Figure3. 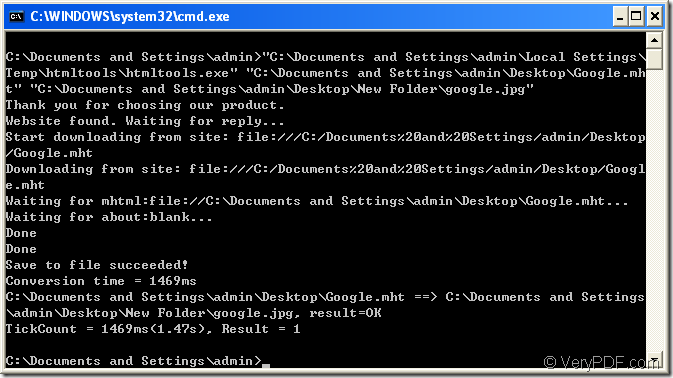 The commands showed in Figure3 are "C:\Documents and Settings\admin\Local Settings\Temp\htmltools\htmltools.exe" "C:\Documents and Settings\admin\Desktop\Google.mht" "C:\Documents and Settings\admin\Desktop\New Folder\google.jpg"
"C:\Documents and Settings\admin\Local Settings\Temp\htmltools\htmltools.exe" is the path of called program—htmltools.exe which is the executable file of HTML Converter Command Line. 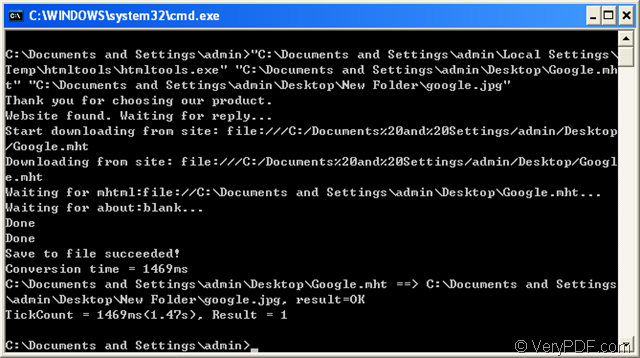 "C:\Documents and Settings\admin\Desktop\Google.mht" is the path of mhtml file format. 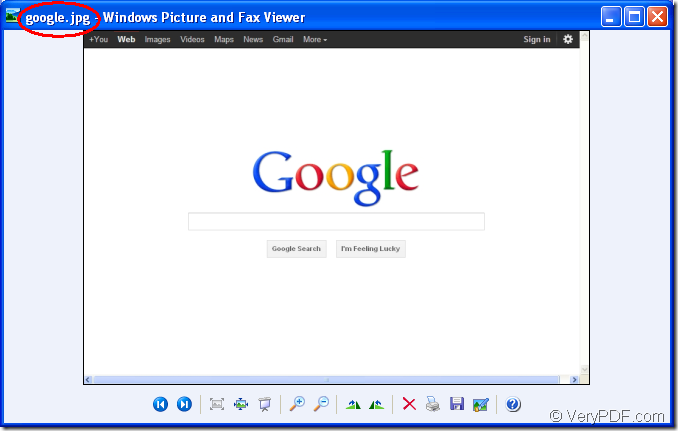 "C:\Documents and Settings\admin\Desktop\New Folder\google.jpg" is the path and name of target file.The path can be set by yourself.If not,the target file will be saved in current directory by default. When there are “Save to file succeeded!” and “result=OK” in the dialog,mhtml to jpg is finished. 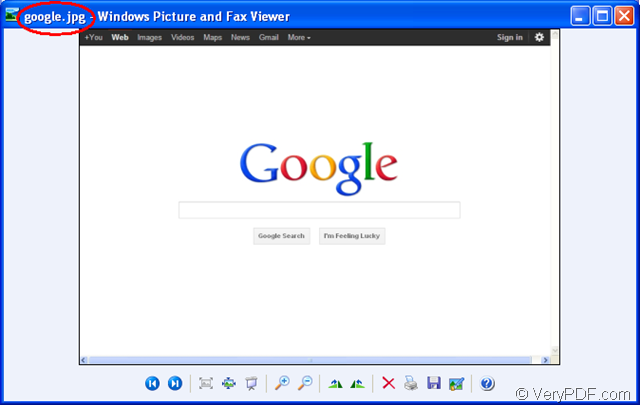 Step3.Find and view target file. Please see Figure4 and Figure5. How to convert MS Office Excel to pdf using Document Converter? How to print Word to postscript file? How to convert a document of mht to jpeg image in a command line? How to export text from PDF to HTML?